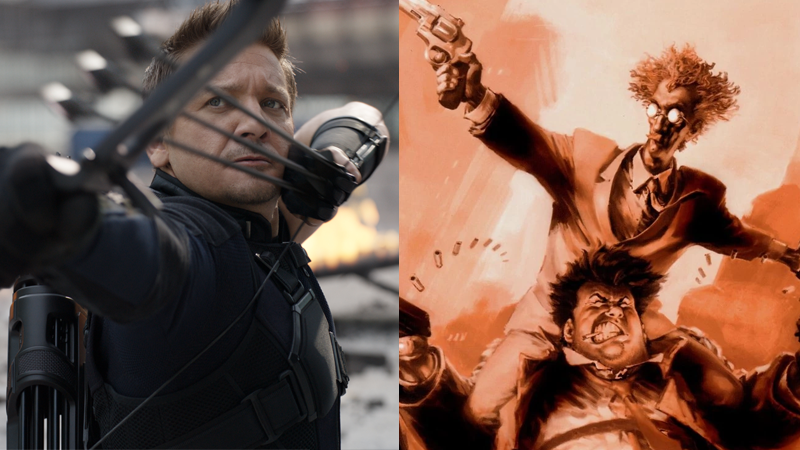 Jeremy Renner being good with a bow in Captain America: Civil War, and Twitch Williams being good with a gun in Case Files: Sam and Twitch #10. Todd McFarlane’s long-in-the-making Spawn reboot has taken another big step toward actually happening. After being rumored last week, it’s now been confirmed that Hawkeye himself, Jeremy Renner, will co-star alongside Jamie Foxx. Both the Hollywood Reporter and Deadline are reporting that Renner has signed on to Blumhouse Production’s take on McFarlane’s beloved, ‘90s-as-hell superhero. While Foxx plays the title role, Renner will apparently be playing a major figure from the comic’s supporting cast, Twitch Williams. In the comics, Williams, often seen with his partner Sam Burke, is a wiry detective in the NYPD with a sharp mind and keen skill with his trademark dual pistols. In both reports, the movie’s take on Twitch is described as a good cop who Spawn reaches out to for assistance in his rage-fueled battle against evil, with no mention of Burke (at least, so far). We’ll bring you more on the Spawn reboot as we learn it.